Nancy Dryden received her BS in Psychology from McDaniel College in 1993. Shortly after, in 1996, Nancy decided she wanted to pursue becoming a professional dog trainer and enrolled at West Virginia Canine College and became a Certified Professional Dog Trainer from the first accredited canine college in the country! Her instruction at the college included private and group class obedience (on and off-leash), tracking, protection work (including working closely with local K-9 law enforcement), agility work, and kennel management. Immediately, Nancy opened Doggy Do Right as a sole proprietor and began obedience training in the Maryland area. Most training was private in-home training for both puppies and adult dogs, but group classes were also offered. In 2001, Nancy moved to Leesburg, VA where she continued to train and shortly thereafter, in 2003, opened an obedience school and daycare facility for Doggy Do Right! For the next 10 years, Nancy operated Doggy Do Right in historic downtown Leesburg and provided training, doggy daycare, and retail. During that time, several trainers were also on staff, and Nancy taught a few apprentice trainers who eventually were able to go out on their own! In 2013 Nancy decided to close the facility and focus on in-home training once again! Nancy’s vast experience includes: behavioral issues; basic obedience and problem solving with puppies up to adult dogs; aggressive (both dominant and fear-based) behavior towards humans and dogs; shy/fearful dogs; temperament testing in both adult dogs and puppy litters; pack structure; evaluating potential dogs for therapy work, as well as therapy dog re-certification testing; serving as an AKC CGC evaluator; Service Dog Training; puppy selection for service dog training; and Service Dog PAT for certification! 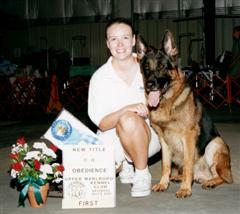 Nancy is pictured here with her beloved GSD "Nando," who was her companion for 14yrs, earning his AKC CD title by taking first place in two of three shows! Her current companion is a rescued a Shar-pei/boxer mix named Tango who enjoys hiking, running, and swimming!